Every year, some seven million people visit the Eiffel Tower, making it the world's most popular monument operating as a paid tourist attraction. Especially when it's your first visit, the money is well worth the views and the experience of ascending the tower. But for anyone watching their spending, there are also more budget-friendly ways to enjoy this iconic monument. One is the hourly evening "light show" that sees the already-bright iron edifice burst into what appear as golden, effervescent sparkles for several minutes. It's simply captivating to behold: a must-see nocturnal attraction in Paris. When to Catch the Show? How Long Does It Last? Every night from sundown to 1 a.m., at the beginning of each hour, the special illuminations burst into view on the horizon. This means, of course, that the light shows are more frequent in the winter months than in the summer, when sundown doesn't fall until after 9 p.m. The display lasts a total of five minutes each time, with the exception of the finale at 1 a.m., which goes on for a hypnotic 10 minutes. There's another reason it's worth it to stay up for the last show of the night: the tower's usual orange-yellow lighting system is turned off, offering an entirely different, considerably more dramatic display. ​On a clear night, you can take in the spectacle from numerous places in the city. Riverside views are favored by most tourists: pretty much anywhere along the Seine River in central Paris between the Île de la Cité and the Pont d'Iéna offers good views of the sparkling iron structure bursting into mesmerizing sparkles. Pont Neuf bridge: The Pont Neuf bridge (Metro: Pont Neuf) is a good place to perch at the beginning of the hour to rest your feet and enjoy the spectacle. From this perspective, you can fully appreciate the sweeping, lighthouse-like motions of the tower's beacon: It's a poetic sight to behold. The beacon sends out two powerful, criss-crossing light beams whose reach extends to about 80 kilometers/just under 50 miles. Place du Trocadéro: Otherwise, many tourists head over to the Place du Trocadéro (Metro: Trocadéro) for much more dramatic, up-close impressions and photo ops of the tower in its scintillating nighttime persona. If you're planning to roam around for an evening walk that might last two to three hours in total, why not start with a more distant vantage of the light show at 9 or 10 p.m. sharp, then head over to Trocadéro for a much closer view? Two shows can be better than one -- especially when appreciated from different angles and perspectives. Montmartre: On a clear night, the distant tower glittering far off on the horizon can be a poetic sight. The real benefit? You can take in some of the finest panoramic views in Paris at the same time, seeing how some of the city's most recognizable places and monuments connect on the horizon. The downside? The show will feel a little too distant for some. Making Magic: How Is The Tower Generally Lit? The Eiffel's current (usual) illuminations are the brainchild of Pierre Bideau, a French engineer who developed the contemporary luminous system in 1985. His new system was inaugurated on December 31 of that year. Bideau produced a warm, intensely vibrant effect by placing orange-yellow sodium lamps onto 336 large projectors. The special projectors allow the Tower to be lit from within its structure: beams of light shoot upward from the bottom of the tower and radiate out, meaning that at all times of darkness, the Tower can be easily seen, even from as far as northeastern Paris and Montmartre. What About The "Sparkler" Bulbs? As for the hourly "light show" effects, which made their first appearance in 1999 to bring in the new millennium, they're the product of an astounding 20,000 6 watt bulbs, whose combined power reaches around 120,000 watts. Each side of the tower has 5,000 of these special bulbs superimposed over the general lighting system, allowing for a magnificent, 360-degree sparkling effect. Amazingly, and despite their visual intensity, the "sparkler" lights consume very little energy: the city government invested in high-efficiency bulbs as part of its bid to reduce Paris' carbon footprint. Eco-conscious travelers need not worry about the spectacle being energy-hungry. For certain annual celebrations such as Bastille Day (July 14) and New Year's Eve, fireworks shows around the tower have been a common element in the city's official calendar. However, in recent years heightened security concerns have made these sorts of displays a bit less common outside of national holidays and special commemorative events. If you're lucky enough to be in town in mid-July or possibly at year end, you might get a chance to take in a fireworks show. 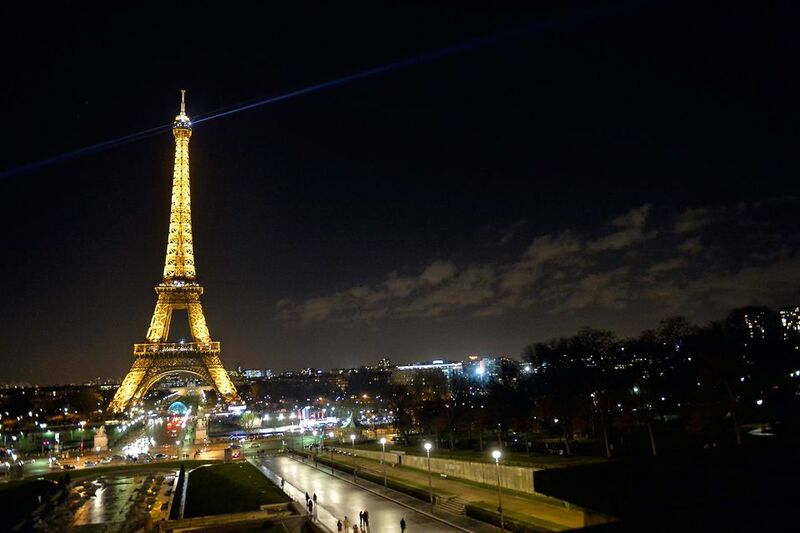 As the most-recognized symbol of the French capital, Gustave Eiffel's beloved tower gets regular pride of place for special occasions-- of both the joyful and sad variety. December 2015: To mark the occasion of COP21, the global climate conference held in Paris that year, the tower is emblazoned with the words "No Plan B" in all caps. Later, on a more hopeful note, it's dressed in all-green lights as a symbol of the city's pledge for a more sustainable future. November 2015: Commemorating the more than 100 victims of the November 2015 terrorist attacks in Paris, the Eiffel Tower is lit in red, blue and white, the colors of the French tricolor flag. 2009: To mark the tower's 120th anniversary, light shows are on display every night for two months between October to December. For one of these shows, the Eiffel is dressed in a variety of vibrant colors, from purple to red and blue, which progressively creep up and down the tower in arty, hypnotic patterns. 2008: The tower is emblazoned with blue and yellow lights to form the colors and motifs of the European flag, for the occasion of France assuming the presidency of the European Union. 2004: The tower is lit in all-red to celebrate Chinese New Year, a popular annual festival in the capital.